On the 15th of August, 2009, members of the AOH gathered on Grosse Ile in the St. Lawrence River just off Quebec to commemorate a centennial. 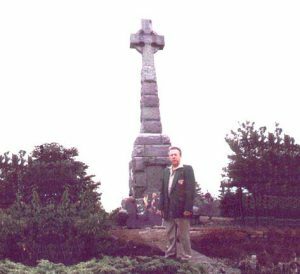 The American AOHs of U.S. and Canada had erected a 50-foot Celtic Cross in sensitive recognition of the thousands of Irish who sleep there in mass graves after fleeing the Great Hunger in Ireland. It was dedicated on the Feast of the Assumption, August 15, 1909 and here we were again, 100 years later, with the late Marianna Gallagher – grand-daughter of the AOH committee chairman who erected the cross – to commemorate the Centennial Anniversary of that event. It was a jovial morning departing from the hotel and a pleasant hour and a half boat trip to the island, but when the massive stone cross came into view, standing as it does on the highest hill on the island, the joy in many eyes turned to meaningful reflection on why it was there. How many had escaped starvation and disease in their beloved Ireland, reluctantly seeking a new life in America, only to find an American grave just outside the door? I thought of them and those who never even made it that far and a verse that I had written down on my first trip back in 1997 – the 150th anniversary of Black ’47! in some lonely unmarked grave. wondering what became of me. As we landed, we were greeted by the lonely strains of a piper playing a lament in the background – a nice touch! We saw the old buildings that these poor souls first saw and we were taken on a tour of what they experienced when they landed. It was a sobering experience. Of course, here and there were commercial distractions such as a film crew interviewing visitors for a documentary to be produced and sold to more visitors; and a gift shop where you could buy a rock from the island shellacked and mounted on a piece of wood that had Grosse Ile printed on it. I thought that amusing as I exited the shop, picked up a small rock from the ground, slipped it into my pocket and wandered over to answer the call of an interviewer to tell her why we were really here. A noon Field Mass was held in memory of those who repose on that historic, yet strangely beautiful island. Reminiscent of the Masses held in the hills, woods and fields of Ireland during the Penal Days, it was celebrated adjacent to an acre of white crosses covering approximately 6,000 of our ancestors in one of three cemeteries located on the island. I couldn’t help wondering that if I missed the return boat to Quebec and had to stay there all night, would I see them; what would I say? How would I explain the inhumanity that consigned them to this fate for eternity? Then the bells of the consecration woke me to the reality that they were no longer there, but with the Lord who surely held them as close as I wished I could have. And I envied them for their heartache was over and the goal we all seek had been realized. After the ceremony at the cross, we were free to wander the island until the boat arrived to ferry us back to Quebec. As we got to the bottom of the hill, I said to brother Keith Carney, I hope you got good pictures of that cross, because I’m never climbing that hill again. Of course, we both knew I was kidding. Brother Carney found the name of a relation on the huge memorial wall at the edge of the mass graves. To me, they were all related; I think of them often, not just on August 15th – the day we came to see them.